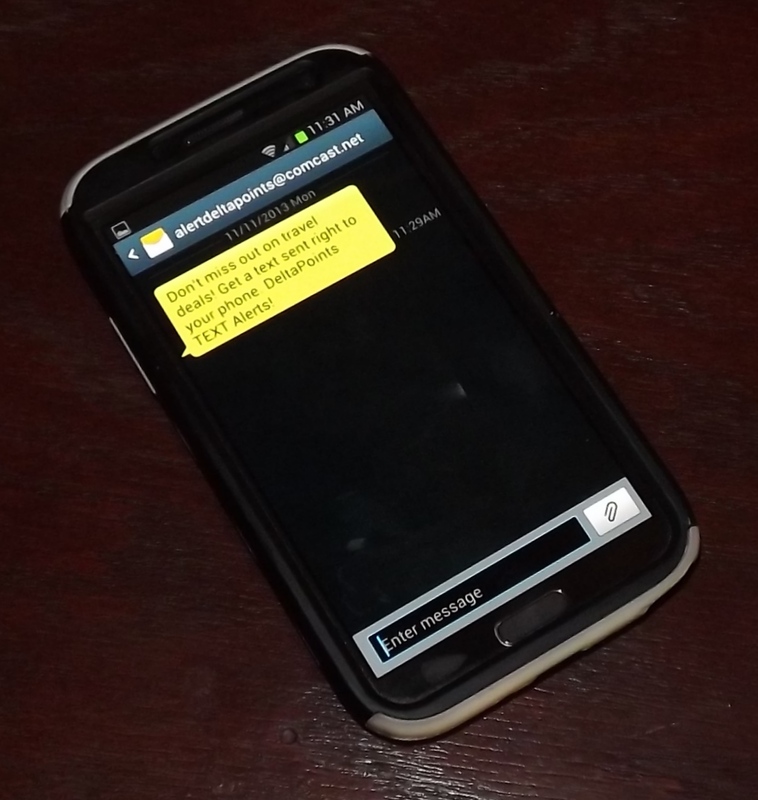 An update to the TEXT ALERTS BETA program – moving forward! I wanted to catch up with what has been going on with the Delta Points TEXT ALERTS program. I went through many different solutions until finding that by limiting the number of phone numbers included, I could get almost instant and reliable results from my Comcast account. It does take a number of e-mails to get the full list out, but it is manageable and free and fast for now. So what tweaks and changes have I decided on? First off, the simple solution that if you no longer want to be on the list just text back STOP and I will remove you. Next, I wish I could customize it so that say that someone in Hawaii or California would not get a text at say 9:AM ET and end up being very early your time. If it is a time sensitive thing, the whole idea of this, I want to get it out ASAP. Just what will I text out? I had some hard and fast rules under the BETA and have received much input from subscribers. Here is what I plan to do (and you can decide if you want to be in accordingly). Let me expand on these. Fare deals that are crazy are always fun and everyone wants to at lease be told about them. Mileage runs. Not everyone is “into” these so it has to be AMAZING to warrant a text, that is under 3CPM. Over that, I will just tweet or post it on the blog. I got blasted for not texting one of the latest card deals. Now I will not alert any of the normal card offers, you can just go to the blog for those, but these are ones that you all know about that happen now and then. Other deals. There are times when deals are so good they are worth a shot. How many texts should you expect to get per month? Still just one or two. Some months maybe none. You must have a normal cell. From the BETA page you can test it. Google Voice stuff just causes Comcast e-Mail issues and I have to go into the list and manually remove them and it takes forever. So no, I am not accepting Google Voice numbers. It’s unfortunate that Google Voice and Comcast don’t play nicely together. Among other things, Google Voice solves the time zone problem – send me a text any time you like – 2am, 3am, whatever. I’ve told Google Voice I don’t want to be disturbed between 9pm and 7am, so it will hold any late night texts until morning. Thanks Rene. How many 3 CPM DL MR’s have you seen this past year? Also, please keep us posted on the “normal” 4 CPM MR’s via the tweets, blog. Thanks.